It encourages nonprofits to hold themselves accountable for the work they do. In a time of diminishing resources, it is morally right that we should meet a high standard of impact in order to be funded. 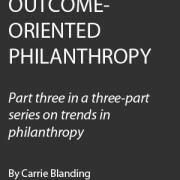 It helps nonprofits develop language that translates better for the new generation of donors. Venture philanthropists and Silicon Valley entrepreneurs are important new players on the philanthropic scene. These are data-driven, results-oriented people, and we need to speak to them in terms they will understand. Applying this to the arts can be challenging, though. Most of what I’ve read on the subject is geared toward education and social service nonprofits, where one can measure things like high school graduation rates, inmate recidivism, distribution of malaria nets. But what are our outcomes in the arts and how do we measure them? I was able to find fell a bit short of what I’d hoped to see. Still, I think the idea behind Charting Impact is a good one. If anyone reading this finds an example of an arts group using it well (or is inspired to be the first! ), I would love to hear about it. Another point of entry into measuring artistic outcomes is the ongoing discussion about “intrinsic” versus “instrumental” impacts. A few years ago everyone seemed to be measuring the “instrumental impact” of the arts — the way in which the arts stimulate the local economy or improve student test scores, for example. However, in the last decade thought leaders like Adrien Ellis and the RAND Corporation have exposed the pitfalls of instrumental arguments for the arts, shifting the conversation instead toward their “intrinsic impacts” — the way that art makes audiences feel and enriches our lives. Intrinsic impacts are tough to measure, though. It’s not obvious how to quantify a feeling and report on it to a funder! But the intrepid folks at Theatre Bay Area and WolfBrown have taken on the challenge. TBA’s 2012 publication Counting New Beans got the conversation started. Then WolfBrown carried the work even further, launching a whole website and line of services aimed at helping arts nonprofits learn to measure and evaluate their intrinsic impact. If you want to understand what it means to measure art’s intrinsic impact, those two resources are the place to start. Regardless of how you choose to approach the issue, the ultimate goal is to find some meaningful way to evaluate your organization’s outcomes, and then use that information to make necessary course corrections and to communicate with donors. At the organizational level that means asking ourselves: Is my organization having the impact that it ought to have? Are the things we’re doing actually achieving the outcomes we set out to achieve? Furthermore, it means developing consistent methods for answering these questions, being brutally honest about the answers and, most important, making changes if at any point we fall short of achieving our goals. 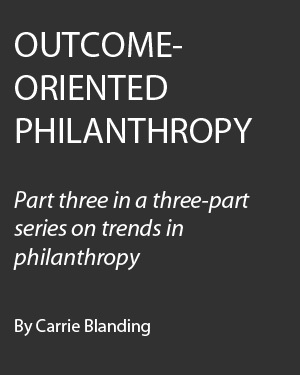 Don’t miss parts one (improved assessment tools) and two (building vs. buying) in Carrie’s series on trends in philanthropy!